Create & manage lyrics collections. Is there a better alternative to KaraTunes? Is KaraTunes really the best app in Music category? 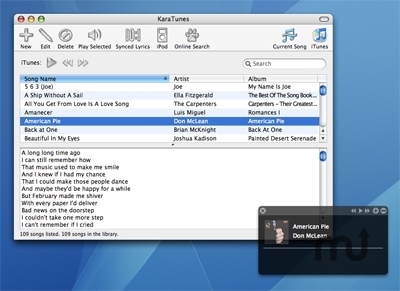 Will KaraTunes work good on macOS 10.13.4? KaraTunes is an add-on for iTunes allowing users to place all of their lyrics data into a single database which can then be saved, modified and searched with an easy-to-use interface. It automatically finds lyrics from online lyrics databases for the whole iTunes Library. Users can create synchronized lyrics and watch them while iTunes is playing. It also allows users to export music and synced lyrics as QuickTime movies to watch on the Mac, PC and iPhone/iPod touch. In addition, users can now set delay time for synced lyrics playback and use customized keywords for Google search. Improved OS X 10.7 Lion compatibility. KaraTunes needs a rating. Be the first to rate this app and get the discussion started!